[147 Pages Report] The healthcare asset management market is expected to reach USD 35.19 billion by 2023 from USD 6.89 billion in 2017, at a CAGR of 31.4%. The base year considered for the study is 2017 and the forecast period is from 2018 to 2023. Growing pressure to better manage their existing workforce has compelled healthcare organizations across the globe to adopt effective asset management solutions and technologies. Most healthcare organizations spend a large portion of their budget on tracking hospital equipment. For example, it was reported that ~USD 6 million worth of state-owned hospital equipment was found to be missing in Louisiana State University (LSU) hospitals; newly purchased equipment from the hospital were also not properly tracked. Thus, wastage of time in searching for lost assets and poor asset management practices can lead to serious consequences. According to a recent survey conducted by the Nursing Times, more than one-third of nurses spend at least an hour locating equipment during an average hospital shift. This not only impacts budgets but also compromises the quality of patient care provided. The use of radiofrequency identification (RFID) in the pharmaceutical industry has grown in recent years. The technology has emerged to become a systematic part of supply chain management in international pharmaceutical production and distribution. Drug counterfeiting is a significant threat to healthcare systems across the globe. Over the years, the number of new cases of drug counterfeiting has grown significantly. This can primarily be attributed to the Internet-based sales of pharmaceuticals. According to Pharmaceutical Security Institute (PSI), in 2016, there was a 5% increase in the number of cases of pharmaceutical counterfeiting, theft, and diversion. In 2016, 3,147 cases were reported as compared to 3,002 cases in 2015 and 2,177 cases in 2014. The study estimates the healthcare asset management market size for 2018 and projects its demand till 2023. In the primary research process, various sources from both demand side and supply side were interviewed to obtain qualitative and quantitative information for the report. Primary sources from the demand side include various industry CEOs, vice presidents, marketing directors, technology and innovation directors, and related key executives from the various players in the healthcare asset management market. 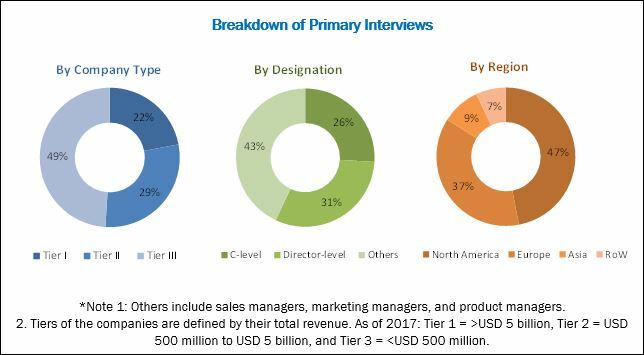 For the market estimation process, both top-down and bottom-up approaches were used to estimate and validate the market size of the healthcare asset management market as well as to estimate the market size of various other dependent submarkets. All possible parameters that affect the market covered in this research study have been accounted for, viewed in extensive detail, verified through primary research, and analyzed to get the final quantitative and qualitative data. This data was consolidated and added to detailed inputs and analysis from MarketsandMarkets and presented in this report. The healthcare asset management market is marked by the presence of several big and small players. Prominent players offering healthcare asset management products include AiRISTA Flow (US), Elpas (US), CenTrak, Inc.(US), ThingMagic [A Novanta Company (US)], Sonitor (Norway), Stanley Healthcare (US), Versus Technology, Inc. (US), Zebra Technologies (US), GE Healthcare (US), and IBM Corporation (US). With this partnership, Stanley Healthcare will integrate Sonitor Sense (a high definition ultrasound-based IPS system) into its existing AeroScout RTLS platform. Zebra, along with GE will introduce Encompass, a Wi-Fi based asset management solution for mobile assets and inventory management. Novanta acquired ThingMagic business from Trimble. This acquisition helped Novanta to expand their RFID portfolio to address the growing need for improvements in workflow solutions, patient safety, anti-counterfeiting, and asset tracking on medical markets. AiRISTA Flow acquired Ekahau, a leading provider of Wi-Fi-based location services and workforce solutions. IBM opened four new IBM cloud data centers, two in London, one in California, and one in Sydney. IBM opened the IBM Watson Health Center on Helsinki, Finland. The center is part of five-year landmark collaboration agreement between Tekes, the Finnish Funding Agency. 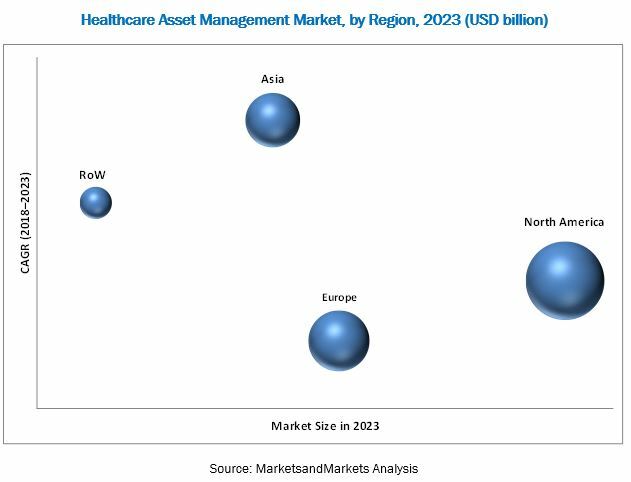 The global healthcare asset management market is projected to reach USD 35.19 billion by 2023 from USD 8.98 billion from 2018, at a CAGR of 31.4%. The growth of the healthcare asset management market is driven by need for better asset management in hospitals, acceptance of asset management solutions in the pharmaceutical industry, and decline in prices of RFID Tags. The report segments the healthcare asset management market by product, application, and region. Based on product, the healthcare asset management market is segmented into radiofrequency identification (RFID) devices, real-time location systems (RTLS), and ultrasound & infrared tags. Of all these product segments, the RFID devices segment is expected to account for the largest share of the healthcare asset management market in 2018. RTLS on the other hand is expected to register the highest CAGR during the forecast period owing to the higher precision and accuracy offered by RTLS for tracking and monitoring assets in healthcare facilities. Based on type, RFID hardware market is further segmented into tags, readers/interrogators, antennas, and accessories. RFID tags are expected to account for the largest share of the RFID hardware market in 2018. The large share can primarily be attributed to the increasing acceptance of RFID in pharmaceutical companies, declining prices of RFID tags, and the availability of technologically advanced products in the market. The global healthcare asset management market, by application is segmented into hospital asset management and pharmaceutical asset management. The hospital asset management segment is estimated to be the largest segment in 2018. The growing need for effective asset management in hospitals, expanding application areas of asset management solutions and the availability of technologically advanced products are some of the major factors driving the growth of this segment. Hospital asset management market is further segmented into equipment tracking and management, patient management, temperature and humidity control, staff management, and infection control and hand hygiene compliance. In 2018, the equipment tracking and management is expected to account for the largest share of the hospital asset management market owing to the need for better asset management in hospitals. The market is dominated by North America, followed by Europe. The dominance of the North American market is attributed to factors such as growing patient safety concerns, acceptance of healthcare asset management solutions in hospitals, increasing need to tackle drug counterfeiting, technologically advanced products, and the presence of key players in the region. While the healthcare asset management market represents significant growth opportunities, market growth may be hindered due to the high cost of RFID readers. The healthcare asset management market is marked by the presence of several big and small players. AiRISTA Flow (US), Elpas (US), CenTrak, Inc. (US), ThingMagic [A Novanta Company (US], Sonitor (Norway), Stanley Healthcare (US), Versus Technology, Inc. (US), Zebra Technologies (US), GE Healthcare (US), and IBM Corporation (US) are some of the prominent players offering healthcare asset management products. 10.9 Stanley Black & Decker, Inc.